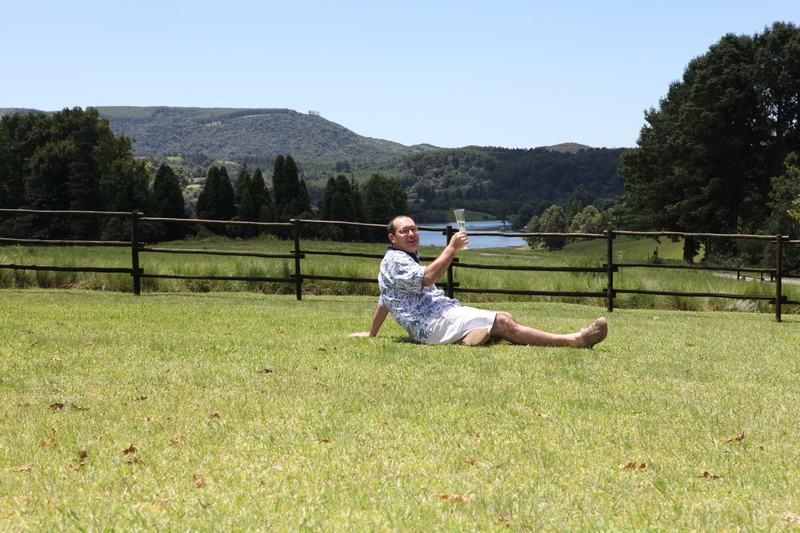 I am sitting on the veranda at Costa Calla in the Karkloof Mountains do the Midlands of KwaZulu Natal. The Old Year ended with a big storm and then mist and drizzle as we turned in to bed before midnight. The New Year has started with a clear bright sunrise at 4:45 am and a Red Chested Cuckoo calling with doves in the distance. The dominant sound is the soft wind in the pine trees across the road; the green veld is short after the winter burn and is not moving at all. The lake in the bottom of the valley is not a mirror, but there’s only a shimmer from the wind rolling off the mountain behind me. The tall pink Watsonia flowers are swaying as they drop pollen into the wind to blow over us. I am sitting alone, there is no one else up yet. Soon the day will unfold with wishes for everyone for the New Year. Then they will all wish me for my Name Day. It’s different to before, when we were a big Greek immigrant family. We stayed up beyond midnight and everyone wished me specially as I was the only Basil left after my grandfather died and my grandmother’s brother Basil moved to celebrate the New Year with his family. Now the New Year heralds just that for my new extended family: the start of another year, filled with hope and promise. Mine does too, but it is also my Name Day. St Basil the Great of Caesarea was born in the 4th century in Cappadocia which lies in modern Turkey today. He is the patron saint of his region of birth, reformers, monks, education, liturgies and believe it or not, hospital administrators! He led a monastic life and was known for his care of the poor and underprivileged. Together with Gregory of Nazianzus and John Chrysostom, Eastern Orthodox and Eastern Catholic Church have bestowed the title of Great Hierarch on them. St basil has also been named the doctor of the church and is referred to as “the revealer of heavenly mysteries” (ouranophantor). It is tradition to serve a vasilopita, a rich bread baked with a coin inside on his feast day. Gifts were brought for all children, and we do in the West on Christmas day. It is customary to set an extra seat at the table on St Basil’s day. This is in honour of the Great Saint, who was born into a wealthy family, and gave g away all his possessions to the poor and needy. The coin in the vasilopita brings luck to the recipient. Legend has it that St Basil called on the residents of Caesarianto raise a ransom to stop the siege of the city. Each citizen gave whatever gold or jewellery they had. When the enemy saw this act of collective giving he was so embarrassed that he called off the siege without collecting payment. St Basil was tasked with returning the unpaid ransom, but he had no way of knowing which pieces belonged to the various families. So he backed loaves of bread and inserted the precious items randomly into the loaves. By his miracle, each family received exactly what belonged to them. The tradition of a cake with a hidden coin is common in Eastern Europe. It is even used amongst the Muslims. But the roots lie in the ancient Greek festival of King Cronos, who was overthrown by his son Zeus. Cronos in turn had used a scythe to castrate and get rid of his father Uranus. To avoid the murderous appointment of kings he later decided that kings should be appointed by lot, hence the recipient of the gold coin can be king for the day in my household.